In the summer of 370 AD, Kirchberg was one of the stops of the poet Decimus Magnus Ausonius on his coach journey from Mainz to Trier along the ancient Roman road named after him, Via Ausonia. It must have been a hot summer because Ausonius wrote: I arrived at the dry village Denzen ("vicus Dumnissus"), where the surrounding fields thirsted for water. What Ausonius alluded to was the exposed position of the village, which is situated high on a mountain and thus, in times of prolonged drought, it certainly would have had problems supplying enough water to the fields. Because Dumnissus is mentioned by Ausonius (Dumnissus=Kirchberg-Denzen), Kirchberg is considered to be the oldest, continuously inhabited settlement in the Hunsrück region. Actually, Kirchberg was already listed, under its Celtic name Dumno, on an even older map, which has been handed down to us by the Tabula Peutingeriana. The Roman name can be found in a record from the year 995, where a Frankish royal estate by the name of Domnissa ("paedium Domnissa") is mentioned. It was only 250 years later (1129) that Kirchberg got its present name, Chiriberg ("church on the hill"). This name aptly describes the unique, exposed location of the town, which is visible when approaching from any direction. In 1259, Kirchberg received its city charter from the Earls of Sponheim, who, in this way, emphasised the central location of the town and provided a direct connection to the Sponheim estates between the Nahe and the Mosel Rivers, together with the other two important Sponheim towns in Hunsrück: Gemünden and Kastellaun. The importance of Kirchberg at that time was also evident in the fact that near the end of the Middle Ages over 50 towns belonged to the greater Kirchberg Parish, also called St. Michael's patronage ("Michaelspatrozinium"). 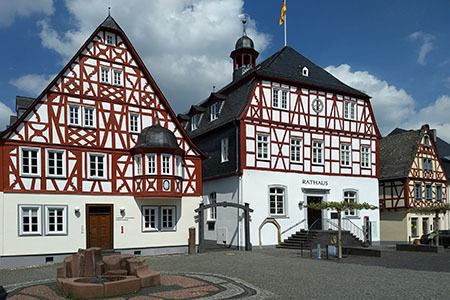 Today Kirchberg is the seat of an association of municipalities, which, with its 40 communities, covers the largest area in the Rhineland-Palatinate region. Kirchberg as the oldest town in Hunsrück, with its historical market and the beautiful St. Michael's Church, continues to prosper as the economic and cultural centre for the region. Encircled by splendid half-timbered houses, the market square provided a distinguished setting for weekly and yearly markets as well as livestock, flax and flea markets over the centuries. Even in 1900 there were 21 markets to which up to 1,000 head of cattle were driven. The only remnant of these great times is the Michaelis market in October, an important tourist attraction. A particularly special historical treasure is a lovingly restored half-timbered house called the "Heimathaus", where countless documents, pictures and photographs let you experience the history of the Hunsrück region at close quarters.